How Many Shopping Days ’til Christmas? You are at:Home»Featured»How Many Shopping Days ’til Christmas? 1. Remember that it’s a birthday party! Well, yes, its much more than that, but essentially, and if you have young children, especially, it really is a birthday party. Last time I read my Bible, Jesus went to parties and enjoyed a good meal, so putting in time to plan a great party including thoughtful presents is a perfectly lovely way to honor Him. 2. Consider Christmas in the gifting. 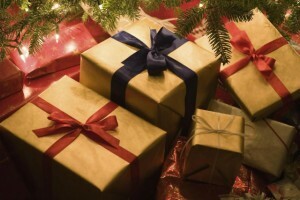 Certain gifts can build tradition, delight the recipients, and keep Christ in Christmas. One of our traditions is giving a single piece to a growing Nativity set for each child. As these grow over the years, our children will have a quality Nativity for their homes as they grow and leave the nest. So many family-run Catholic and Christian businesses have creative and fun options for your family that are edifying as well: Jewelry, books, games, toys, home décor, educational products, etc. Google it and you will find it. 3. Be Christian even when you don’t feel jolly. Kindness, compassion, generosity and gentleness are a precious gift to our Lord when done in His name and in the chaos and frenzy of a shopping center in December. If someone is rude, pray for them. When waiting in line, say a Hail Mary for those you are shopping for before checking your watch. Do all things with Love. 4. Keep in mind that you are supporting businesses and workers who depend on this shopping season to earn an income. Don’t grouch and humbug over the commercialism, consider the hardworking people who are able to make a living and be proud to be a part of it. Make an effort to support small businesses, online and local, even if you may spend a few extra dollars. You will feel the difference a little in your pocket, but a lot in your heart. 5. Don’t overdo it. Easier said than done, but finding a plan or a rule for your family can help. Some families spread the celebration through the entire Christmas season, opening gifts slowly and getting together with different friends and family through the Epiphany. Some do a something to read, something to wear, something I want rule for each child. Some choose names from a hat for inter-family gifts to keep quantities and spending in check, or exchange homemade gifts only. Santa always brings 3 gifts per child (plus some stocking stuffers) at our house. Why would he give you more gifts than Baby Jesus got? Don’t sweat it if you overdo a little in the spirit of giving. On this day, God was excessively generous with His Gift, too.